When you breathe, oxygen from the ambient air travels through your nose, down your windpipe and into your lungs where it enters the bloodstream. It then travels through the blood bound to hemoglobin – a protein found in red blood cells – to oxygenate the cells, tissues and organs of your body. Oxygen saturation (SpO2) is a term referring to the concentration of oxygen in the blood, or the percentage of hemoglobin molecules that are saturated with oxygen. One hemoglobin molecule can carry 4 oxygen molecules. Your oxygen saturation level can be estimated with a pulse oximeter, a small medical device that clips onto your finger. 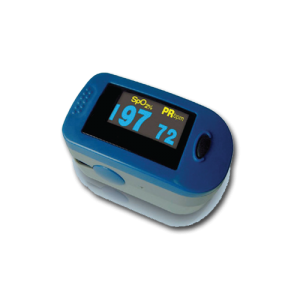 You can click here to view and purchase the pulse oximeter sold directly on the Inogen online store. The most accurate way to measure oxygen saturation, however, is through a blood test known as an arterial blood gas study. Normal blood oxygen level ranges between 95-100%. It’s not uncommon for people with lung disease to have below normal levels. In general, supplemental oxygen is prescribed when the oxygen saturation level stays at or below 88 percent. It’s normal for oxygen saturation levels to fluctuate with activity. If your oxygen saturation level runs low on an ongoing basis, whether at rest, during activity or while you sleep, talk to your health care provider about using supplemental oxygen. In order to function properly, your body needs a certain amount of oxygen circulating in your bloodstream at all times. When the level of oxygen in the blood drops, hypoxemia, or low blood oxygen levels occur. Hypoxemia can lead to hypoxia, or low oxygen in the tissues. Ongoing hypoxemia in COPD can lead to pulmonary hypertension (high blood pressure in the lungs) and secondary polycythemia (an overproduction of red blood cells); it can also lead to other complications. Treatment with supplemental oxygen increases the amount of oxygen in your bloodstream, which increases the amount of oxygen to your cells, tissues and organs. If you have a lung disease that impairs your breathing, getting more oxygen can help you breathe better and live longer. Whether you choose a home oxygen concentrator like the Inogen at Home or a portable oxygen concentrator like the Inogen One G3 or Inogen One G4, supplemental oxygen helps reduce the risk of hypoxemia or hypoxia by providing you with oxygen as needed or on a continuous basis, 24/7, Inogen has a solution for all your oxygen needs. WebMD. “Hypoxia and Hypoxemia”. Last reviewed June 12, 2014. Pleased with your info-very informative. What I need from you are the details needed to obtain the portable inogen. I need to know how much my cost is. I'm 79 years old. Be specific with your directions. I can never get a straight answer to this. Without me using oxygen, my oxygen levels, in just a matter of a minute or two, will go from the high 90%'s, like 97 or 98, then drop down to 85 or 84, and then go right back up to the high 90's, and go up and down like this all day long. What can cause this? I've had a cat – scan on every part of my body. I'm 72 years old. They see nothing really wrong with my lungs, but say I might have a little emphesemia? I also have a small cyst on my liver and one on my left kidney, but they say these are nothing to worry about. Is this dangerous and could it be caused by heart disease? I don't feel anything because of it. Since my blood oxygen level is above 93% for half of the time in every few minutes, am I getting enough oxygen to my organs? No one has the answer. They have me on oxygen but I really don't see much difference in my oxygen levels and what my oxygen does if I'm using it or not. Hi Rodger, When your oxygen levels drop like that do you experience any symptoms like coughing, wheezing or sweating? If so you could be experiencing hypoxemia and you need to go to the hospital right away. We cannot speak to the cyst on your liver and kidney as we have not examined you. In regards to your question about oxygen getting to your organs when you are at 93% – normal oxygen levels range between 95-100%. Values under 90% are considered low. At 93% oxygen saturation, you are lower than what is considered normal but higher than what is considered low, so it is important to continue to monitor your oxygen levels. Weird. My oxygen levels float around 96 percent when I'm working or exercising or walking etc., But when I am at rest they fall..usually to around 93 give or take. That seems to me to be the opposite of what I would expect. Join the group Rodger … labile oxygen saturation PPHN in newborns. Mine go up and down like a yo-yo (74-99). No one seems to know and they like to tell me that my oximeter is off. I understand that as long as it doesn't stay low for more than 4 minutes at a time, there's no damage? Good luck to us.